Thank you for taking the time to stop by Coffs Jetty BnB. We look forward to seeing you soon! 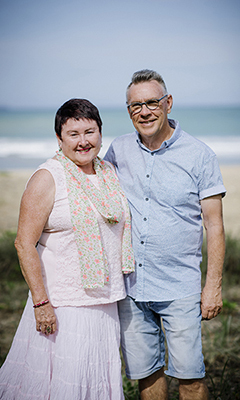 G'day, we're the hosts of Coffs Jetty BnB Geoff and Sue. We've lived on the beautiful Coffs Coast for a quarter of a century and wouldn't live anywhere else. With it's pristine coastline, lush rainforests and friendly locals. We recently decided to open up our own bed and breakfast. Coffs Jetty BnB is a new, modern Bed & Breakfast in the heart of the action at The Jetty, located close to everything, yet is positioned in a quiet, peacefull location where you can shut the world out and just relax. Our BnB is located in the heart of the much sought after Coffs Jetty with only 5 minutes walk to the beautiful surrounding beaches. It also is close to home of some of the best dining on the Coffs Coast. If you are after a bit of adventure then the Coffs Coast has got it all. You can charter out into the deep blue for a spot of game fishing, or if scuba diving is your preferred form of deep sea action set out to the amazing South Solitary Marine for a glimpse of God's wonderful creations. For the ladies who love to shop then where better to grab a bargain than Park Beach Plaza boasting over 150 speciality stores not to mention Coffs Central located in the heart of the city centre. We invite you to come and experience it all for yourselves.